To select various data from computers, users or devices in System Center Configuration Manager database and to make collections, you have to create various SCCM queries. In the SCCM query editor, there is quite a convenient wizard to navigate you through System Center classes and attributes. To show the necessary information to the users, I prefer making html SCCM reports. The problem is that if you would like to make an HTML report based on a SCCM query, you will discover that the SCCM query code cannot be used to create a report. The matter is that ConfigMgr queries are written in the WQL language, but SCCM reports require to use SQL queries to the Microsoft SQL Server database. Though WQL and SQL syntax have much in common, you cannot directly convert a WQL query into SQL. 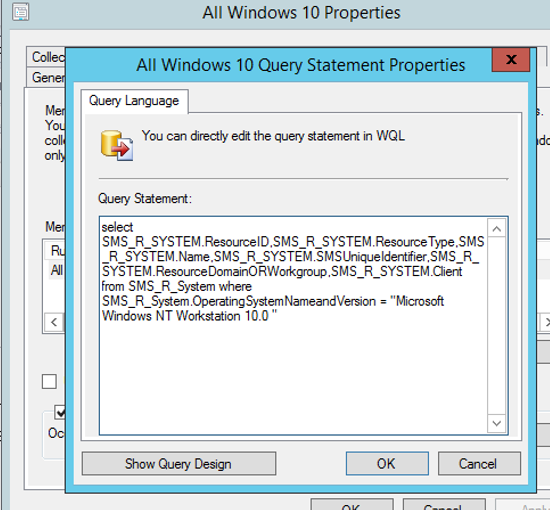 In this article I’ll show a simple and fast way to get an SQL query code from any WQL query in the SCCM. As you can see, I consider that a user computer has not been turned off at night if the date of the last scan (LastHardwareScan) is not equal to the OS boot date (LastBootUpTime). Now you must make an SQL query from this one to create a report with the list of computers and users. It is quite complicated to convert this query into SQL. (Of course, you can use SQL Server Report Builder to construct the query code, but there is an easier way to do it.) The fact is that to execute queries the ConfigMgr engine translates WQL queries into t-SQL syntax using WMI provider and executes an SQL query against SCCM database. All these operations are recorded to the smsprov.log file. 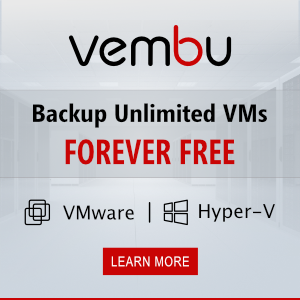 So run your query and open the file \ConfigMgr\Logs\smsprov.log. Find your query in the log file. It should start with Execute WQL =. Pay attention to the string below starting from Execute SQL =. This is my WQL query converted to t-SQL. Copy the code of the SQL query. You can use it to build a SCCM web report or in the Report Builder. Since the original WQL query has been restricted to the SCCM collection, the SQL query also has the restriction on the collection ID (in this example it is CM100213). The error indicates that the current user has not been assigned the db_datareader role to access the database table. To fix this error, you must manually grant the access to the table or to the view in your SCCM database. 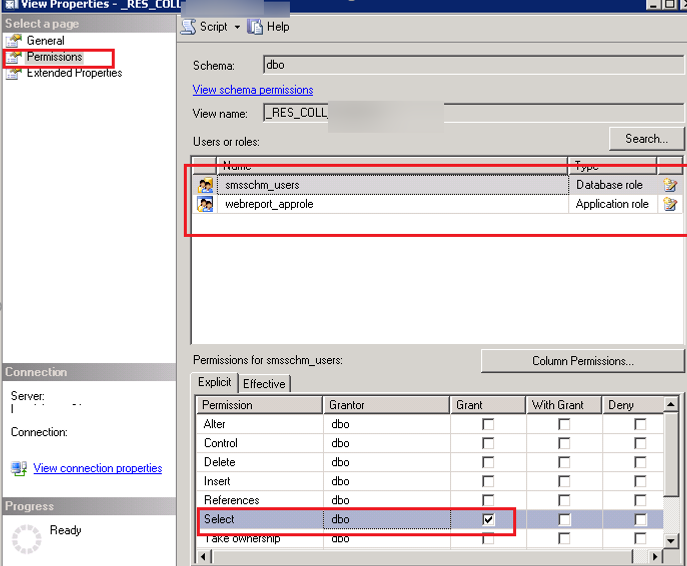 To do it, open the SQL Server Management Studio, connect to the SCCM database, find the table (in this example it is _RES_COLL_CM100213) in the Tables or View sections and open its properties. Try to refresh the web report in the browser, and if another “The SELECT permission was denied” error appears in relation to other SCCM tables, assign the access permissions to these tables in the same way.